We’re thrilled that the wonderful Parents in Touch reviewed our latest wordless picture book Caged as part of their collection of Fiction books for children aged 2-5 years! Caged is a witty tale, sharing a message of retribution and freedom, without using any words! 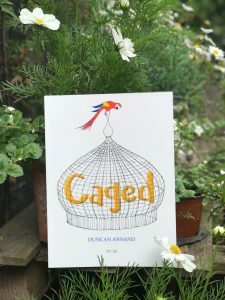 It is Duncan Annand’s debut picture book. Read the wonderful review below! Wordless picture books are really hard to review, as writing about them seems to me to defeat the whole object of the wordlessness, which is to allow the reader to put their own interpretation on the pictures. Caged is the third title in Tiny Owl’s wordless picture book series, continuing the publisher’s championing of wordless books as a means of encouraging children’s creativity and imagination in storytelling. This is an excellent initiative to encourage discussion, enhance the appreciation of illustrations in picture books and develop comprehension skills. Caged is perfect for the classroom! A review by a teaching assistant! Meet the mind behind Caged! Watch an interview with Duncan Annand!